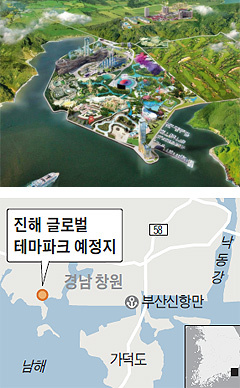 Hollywood film studio 20th Century Fox is reviewing plans to build a theme park on Yeongjong Island, Incheon. Gregory Lombardo, Senior Vice President of Global Location Based Entertainment under 20th Century Fox, said he wanted to “build a global theme park on Yeongjong Island” when he visited Incheon Mayor Yoo Jeong-bok at Incheon City Hall on Thursday, according to a statement released by the local government on Friday. The old site of the Milano Design City (MDC) in Unseo-dong, Jung District on Yeongjong Island, has been mentioned as a possible location for the complex. The potential location of Paramount Movie Park Korea is being considered, too. The park, which was planned for Songdo, Incheon, also fell victim to the ailing Korean economy. 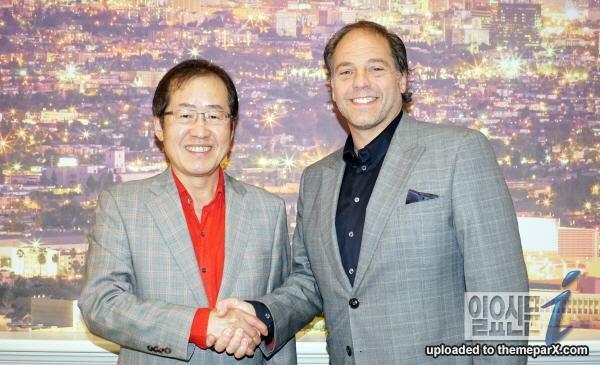 Mr.Hong, Gyeongsangnamdo Provincial governor and Jeffrey Godsick, 20th century Fox president in LA. 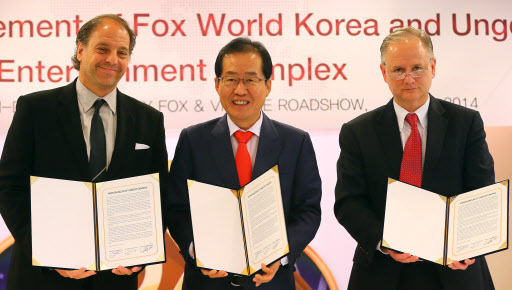 South Gyeongsang Province, 20th Century Fox and Village Roadshow signed a three-party MOU on Wednesday to build a global theme park in the Busan-Jinhae FEZ by 2018. Global entertainment provider 20th Century Fox has signed on with Australian media company Village Roadshow to open an integrated leisure complex in the southern part of the country ― a project that is expected to create a total added value of 2.2 trillion won ($2.1 billion), according to industry sources. The blueprint ― including a Fox theme park, six-star hotel, casino, movie complex, premium shopping outlet mall, 18-hole golf course and a marine sports center ― is the centerpiece of the provincial government’s 50-year development vision, according to officials. To achieve the goal, the parties will establish a special purpose company by the end of this year and kick off the construction next year, in the hopes of opening by 2018. “Fox is deeply committed to Korea, and we have been producing a wide range of Korea-based entertainment contents over the past three years,” said Jeffrey Godsick, president of the American company’s consumer products division.